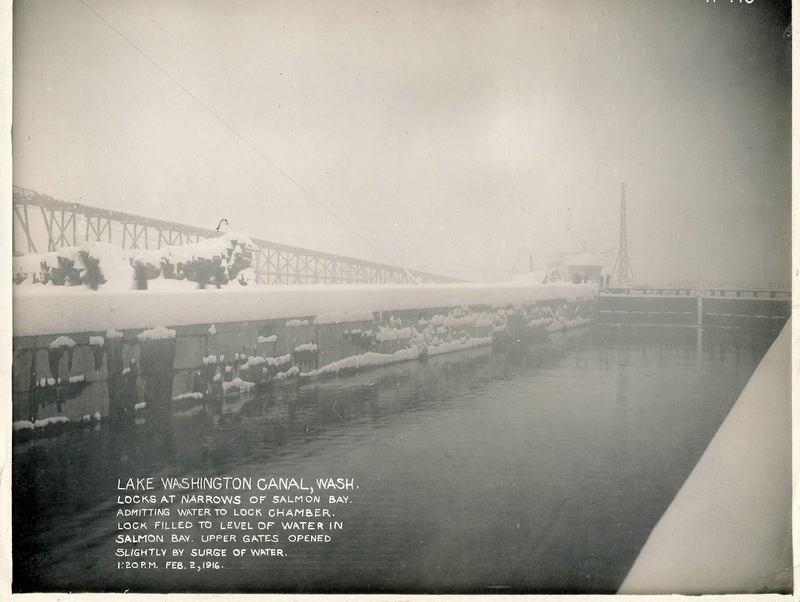 January 31, 1916 started out like any other cold, damp winter day in the city. Then mid-morning it started to snow, it kept coming down all day and on into the night. 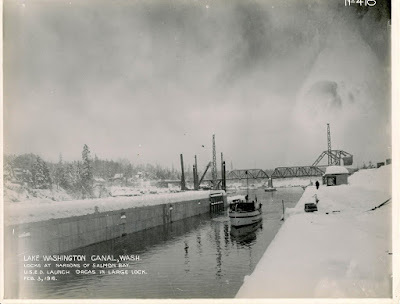 The storm continued steadily for 2 days: schools were closed, streetcar service was shut down and a snow slide closed the Northern Pacific Railroad’s Stampede Tunnel, halting train service across the Cascades. By early afternoon on February 2 the wet snow was so deep it collapsed the roof of the West Seattle Christian Church, and several hours later the dome of St. James Cathedral crashed down under the weight of the heavy snow. The storm left Seattle with 3 feet of snow on the ground. But over at the government locks in Ballard the workers were focused on something else. 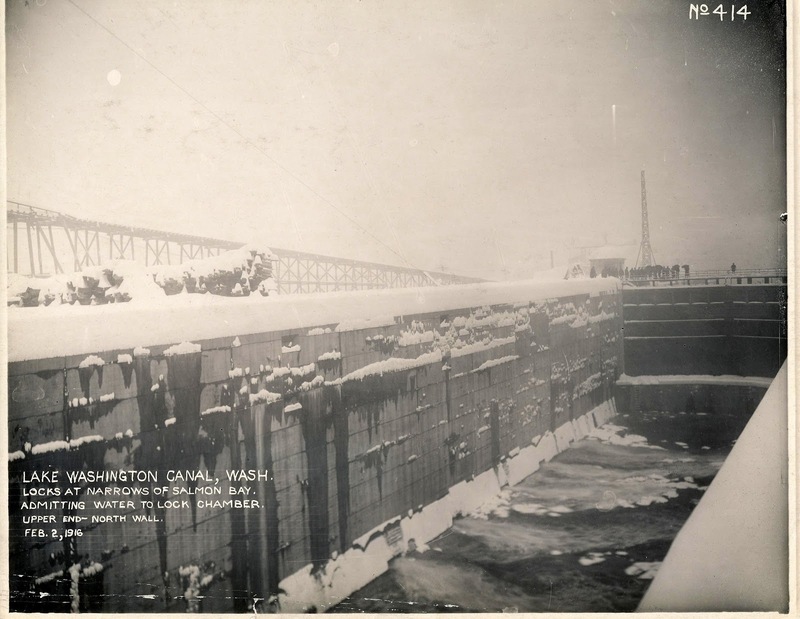 The cement work of the large lock was completed and the miter gates installed, it was time to open the valves and admit water into the chamber for the very first time. In this photo taken just after noon on February 2, you can see the water coming from the filling tunnels at the floor of the lock, notice the staff on the upstream gate watching as the water pushes into the snow. There must have been a sense of jubilation and pride that after decades of politics and planning- and 5 years of construction- it worked! Perhaps this group photo was a celebratory one, Chief Engineer Major J. 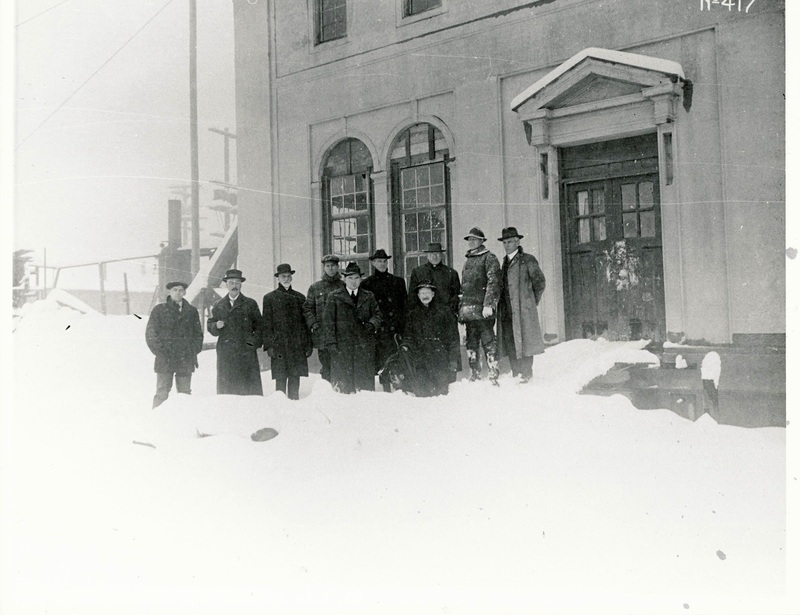 B. Cavanaugh and his staff on the steps of the administration building on that momentous day (Cavanaugh is third from right in hat and glasses.) The Engineering Department workboat Orcas did a trial lockage the next day and the lock was then in operation. 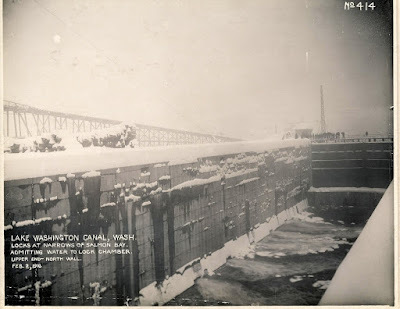 The small lock went into operation July 25 and an informal opening celebration was held August 3, 1916, the official dedication was held on July 4, 1917.